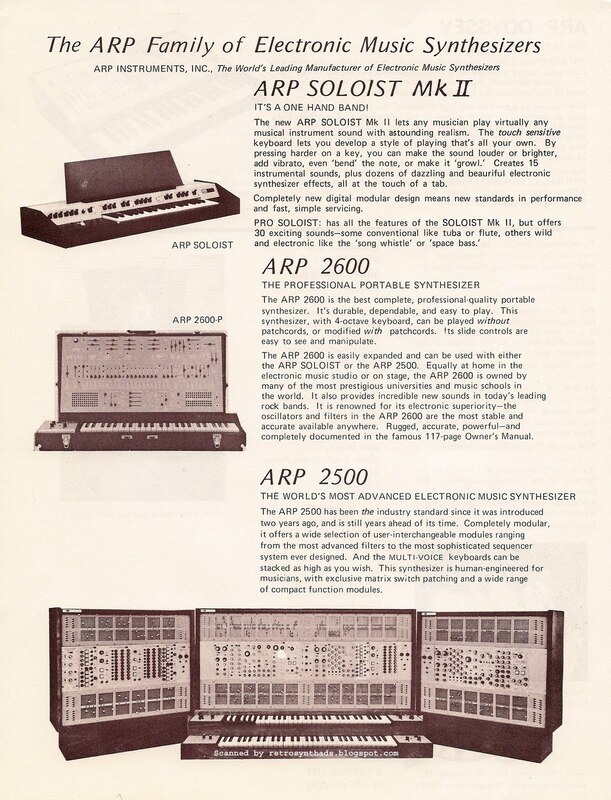 'The ARP Family of Electronic Music Synthesizers' dealer ad sheet (front and back) from the 1970s including the Soloist Mk II, Pro-Soloist, 2600, 2500, and Odyssey. 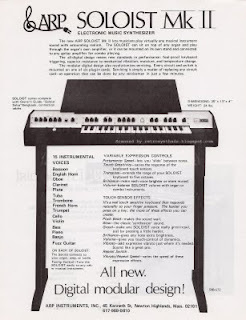 I don't have an exact date on when this dealer ad sheet was printed, but my guess is around 1972 or 1973 since the Pro-Soloist is mentioned alongside the Soloist Mk II... What? Soloist Mk II? What is this piece of kit? Why have I never heard of it!?! 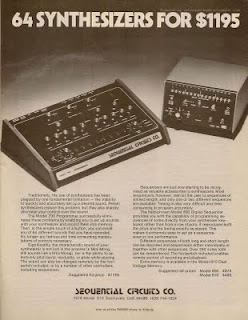 Looking at the Soloist Mk II description and photo from this scan, it looks to be the evolutionary 'missing link' between the original Soloist and the Pro-Soloist. 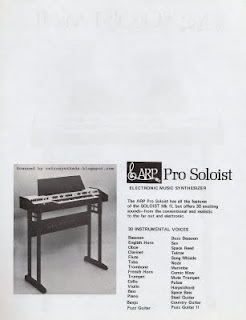 The Pro-Soloist Wikipedia page and Mark Vail's 2006 article on the Pro-Soloist have some good history of these two instruments and inform us that the original Soloist was entirely analog while the Pro-Soloist used digital read-only memory chips to program all of its internal functional modules. If I'm not mistaken, neither mentions the Soloist Mk II. 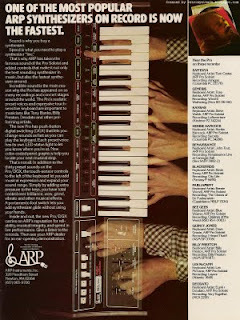 Images of the two instruments from the Vintage Synth Explorer page clearly show that the Soloist had a light-coloured panel of toggle switches located underneath the keyboard while the Pro-Soloist's switches were located on a dark panel above the keyboard. Again, no mention of the Soloist Mk II. I found two references to the Mk II online in forum and comment posts - both by who seems to be the same person - who I now dub thee Soloist Mk II expert. - a 2008 comment by Micke on the Vintage Synth Explorer site mentions that the production dates for the Mk II was between 1972 and 1973. - a 2006 BlueSynths forum post by Micke (Mikael L) where he describes it as a cross between the original Soloist and Pro-Soloist. 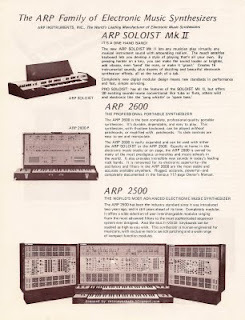 There is also a mention of the Mk II in an ARP 2500 brochure PDF on Tim Stinchcombe's Web site. The last page of the brochure contains the same list and images of the ARP instruments in this dealer ad sheet and lists the Soloist Mk II for $995 US. But other than those references above, I can't seem to find much on this instrument. I even failed to get Google images to bring up a photo. I'll have to add it to my list of Wikipedia updates I need to do. 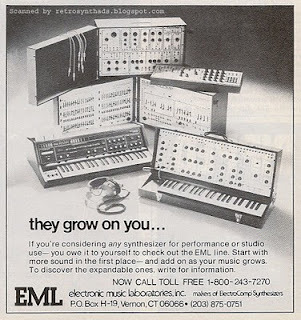 E-mu Systems Inc. Emulator sampler advertisement from page 41 of Keyboard Magazine January 1982. Wow, what a great ad. Simple and memorable. 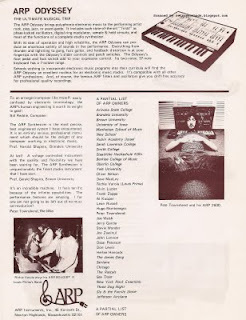 And, probably hit the right market segment - musicians that were into samplers at the time were probably also heavy into science fiction as well. 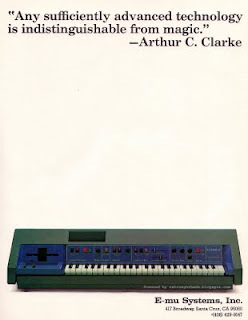 But it begs the question - did Sir Arthur C. Clarke actually endorse the Emulator? 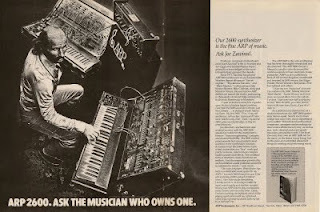 If so, what was the connection between Clarke and E-mu? I had to find out, but this is one case where I took the long road. Science fiction readers, including myself, will tell you that Clarke wrote some awesome sci-fi - heavy on the science. Movie buffs will throw out the fact that he collaborated with Stanley Kubrick on the film 2001: A Space Odyssey. And tech-junkies will quickly remind you that he is known for contributing to the idea of the geostationary communications satellite. But none of these facts connect Clarke directly with music technology or with E-mu. Clarke's quote in this ad is well known among sci-fi enthusiasts as the third of his Three Laws of Prediction and has been referenced or alluded to numerous times by others in literature, movies and video games. I took a look at the Wikipedia page for further investigation, but again, found no direct links to music technology or E-mu. Clarke's Wikipedia page didn't bring up anything directly related to music technology either, but following a few links from his page did eventually lead to a few surprising musical connections. One of those links was to John Pierce's Wikipedia page. Turns out John Pierce, also associated with the concept of the geostationary communications satellite, was a good friend and colleague of Clarke as well as a fellow science fiction author. But most importantly, he was prominent in the research of computer music. 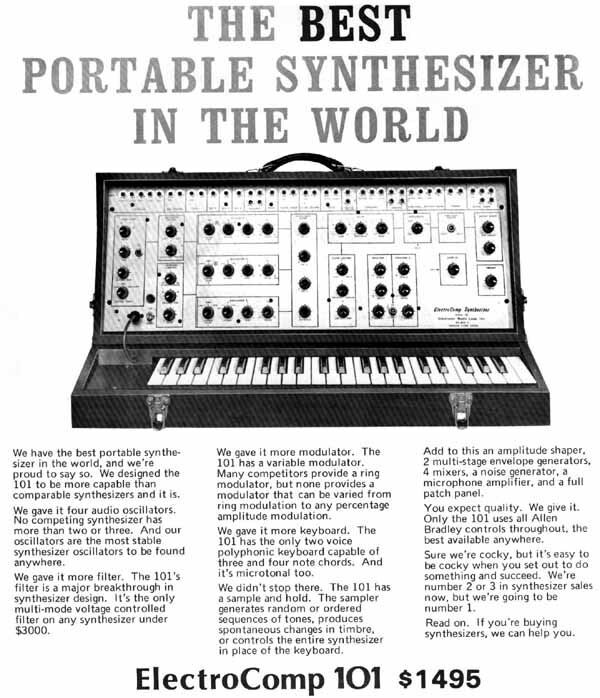 And, according to the Bell Labs Web site, Clarke was visiting Pierce at Bell Labs in 1962 while a demonstration of a vocoder synthesizer was underway. The song used in this demo was 'A Bicycle Built for Two' (aka 'Daisy Bell') and Clarke was so fascinated by the performance that he later used it in the climactic scene of the novel and screenplay for 2001: A Space Odyssey. Pierce, while working at Stanford University's Center for Computer Research in Music and Acoustics (CCRMA, pronounced 'karma'), presented an excellent speech for the Arthur C. Clarke Lecture series in Sri Lanka in 1987. During the talk, Pierce spoke on such topics as space, satellites, and computer music. He also mentions John Chowning, the director of CCRMA. Chowning, among other things, just happens to be an electronic music pioneer, composer and the guy credited with inventing FM synthesis - you know, the technology used in many of Yamaha's synthesizers including the DX-7. The Mix Web site has a great 2005 interview with Chowning where he talks about FM synthesis, CCRMA, and other things music-related. Definitely check that out. A 2006 audio interview with Chowning is also available on Wikipedia. Clarke was obviously connected to some electronic music heavyweights. But still, throughout all this research, there was still nothing to connect Clarke directly with E-mu. Time to get creative. Or logical, depending on how you look at it. 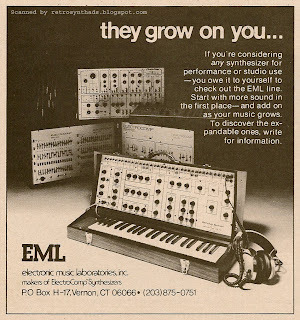 According E-mu's corporate history, Marco Alpert was the marketing manager at E-mu around the time this ad came out. 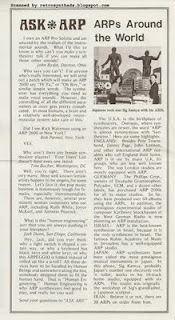 And, in an E-mu article in the September 2002 issue of Sound On Sound, Alpert is credited with "...many new product ideas as well as some of the company's best adverts. This guy would know the connection. I tracked down Alpert at Antares Audio Technologies (maker of Auto-Tune and other plug-ins) where he now works as V.P. of Marketing. I left a voice-mail message and he called back almost immediately. Finally - an answer to the question. What is the connection between Clarke and E-mu? Marco Alpert is a fan. "I didn't have any permission." Alpert admitted. "We were young at the time, learning as we went along. 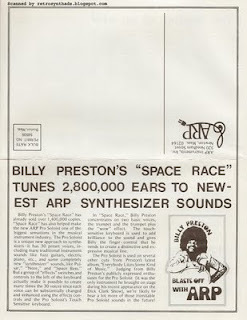 I was a big fan of science fiction like many synthesizer/tech guys at the time. Clarke was a popular author and I loved that quote. Best of all, it fit perfectly." The long road to a perfectly simple answer. 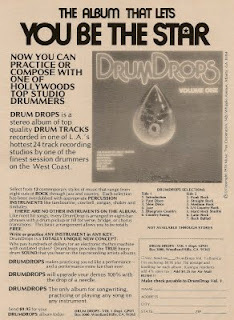 "This is indeed a very cool ad on the face of it, but I can tell you for sure that this was not written by Bob Moog. To those of us who knew him well, this is evident in so many ways." ... "This ad has a slick marketing department's fingerprints all over it, not Bob's". It explains why this ad is so different from other Moog ads that appeared before it and provides us with an insider's perspective... Seriously - read the whole comment. Ms. Moog-Koussa - no disrespect to the Moog name intended. It was indeed a slick marketing department. 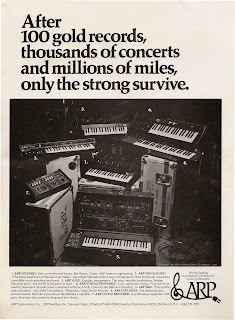 Moog ad from page 26 and 27 of Contemporary Keyboard Magazine May 1977. 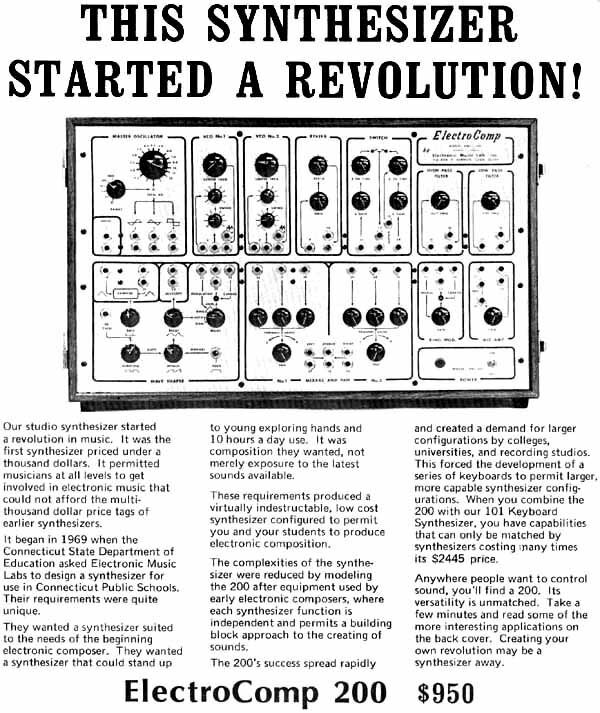 This rare 2-page centerfold advertisement from Bob Moog only ran once or twice, but it brings to light what I think was happening in the synthesizer market at the time: as synthesizer technology became more affordable and new companies and products started coming to market, competition was heating up. 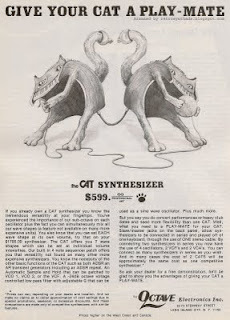 Moog was, in no uncertain terms, defending their turf from the Axxes, Odysseys, CATs, and other synthesizers that were starting to pop up. Like any good leader in a turf war, or like me when I play the game Risk, Moog decided the best defense is a good offense. 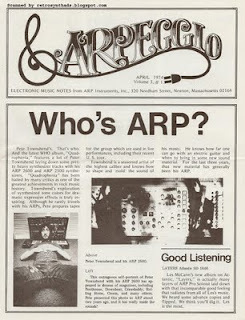 Name dropping: If you've read my blog in the past, you are aware that I've crowned ARP the king of name-dropping. 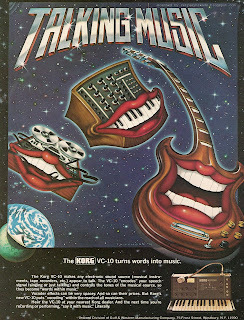 In this ad, Moog hits back with a few heavy-weights of their own - including Chick Corea, Herbie Hancock, Jan Hammer and Walter (now Wendy) Carlos. 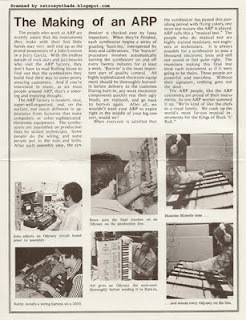 Promotion of their creative design: I've pointed out in a few posts that ARP was fond of the term 'human engineering' around this time period. Throughout this ad, Moog takes aim squarely at ARP by using the term 'musical engineering' multiple times. 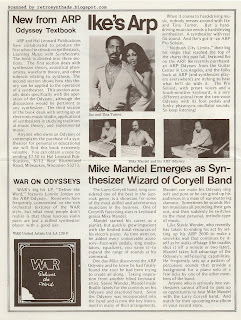 Attacking rumors: I'm not sure when this pots vs sliders debate started bubbling to the surface - maybe there was ongoing rumors or debates in music stores or some of the industry mags at the time - but in this ad, Moog wanted to make it clear to readers that their engineers knew best. And is it just me, or does Moog throw a punch directly at ARP with the line "Just try to accurately tune and all-slider instrument!" ? 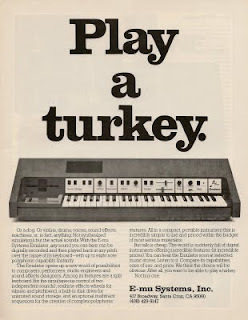 Reading this ad in 2009, Moog may come off as arrogant to some, but I think they got the tone just right. 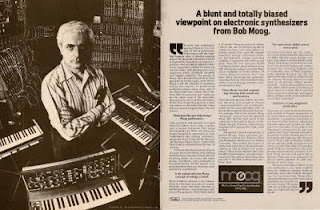 The ad starts off with a humorous tone but still lets you know right off the bat that this is Bob Moog's opinion [Update: the company's opinion]. 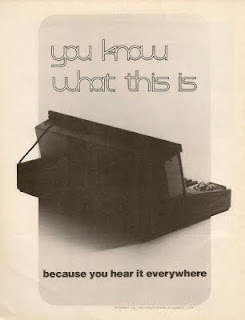 Also, although Moog knows that they were the bee's knees of the synthesizer world, they take the high road and never actually mention any competitor's names in the ad. 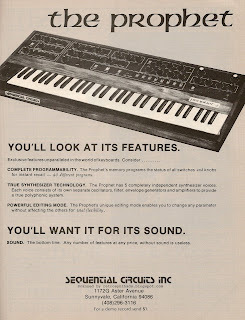 Yamaha CS70M synthesizer advertisement from page 25 of Keyboard Magazine April 1982. I actually posted this scan earlier in the year, but never got around to blogging about it. 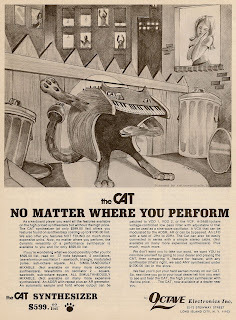 Almost two and a half years after the infrequently-run CS40M/CS20M/CS15/CS5 ads began appearing in Keyboard, Yamaha launched this (also) infrequent CS70M ad in early 1982. 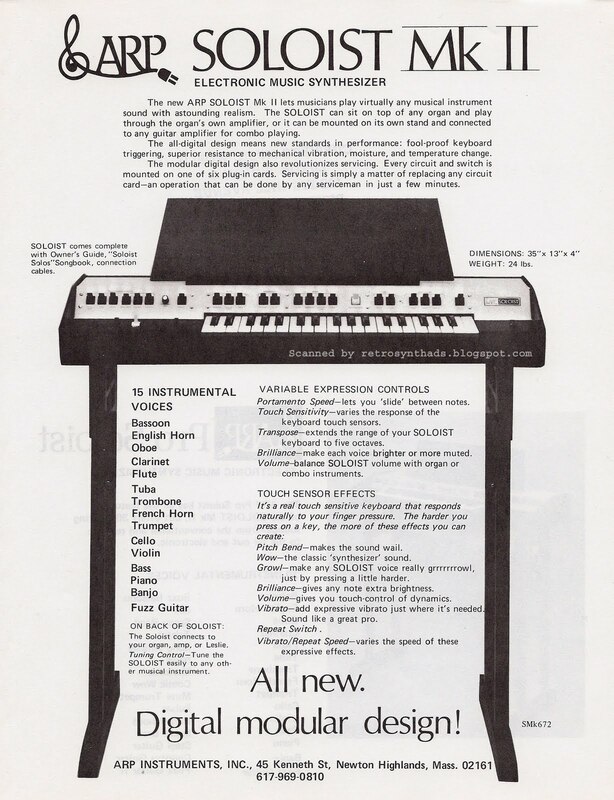 I don't think I'm going out on a limb when I say that although Yamaha ads were pretty common in Contemporary Keyboard/Keyboard throughout 1981-82, their large family of keyboards, electric pianos, mixers and other gear may have made it particularly hard for any one individual ad to really 'stick' in the minds of readers. 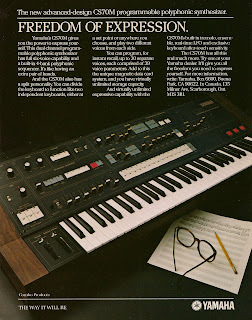 And that's a shame, because although a reader may not recall any ads, he or she would definitely recall hearing the sound of a CS-series synth. Vintage Synth Explorer calls the CS70M lush - and I have to agree. Is it a substitute for a CS80? Um... not in my opinion. 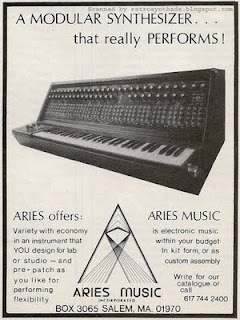 But it really does give a lot of synths a run for their money. Surprisingly, there is not a lot of reference information on the Web about this beast, and even Wikipedia only has pages for the CS80 and CS30/CS30L (as far as the older CS-series are concerned). 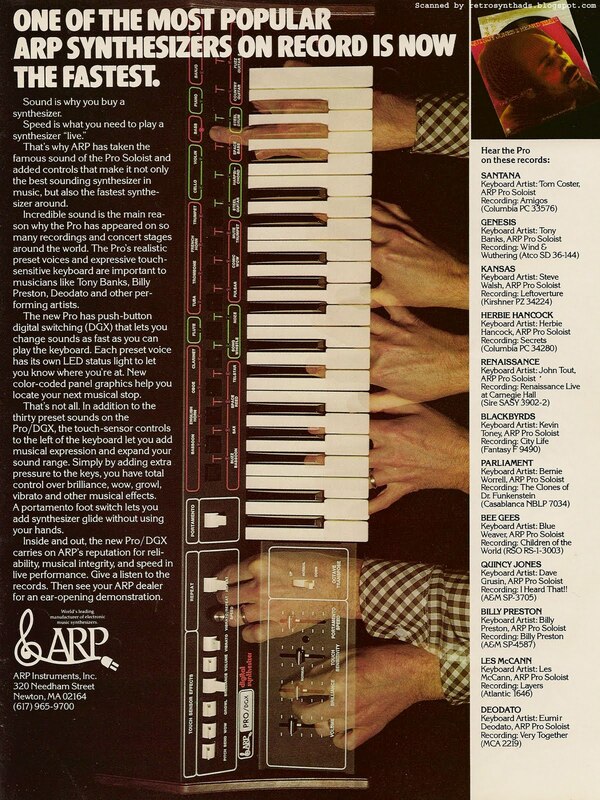 Vintage Synth Explorer, as mentioned above, has some good reference material. And a quick MATRIXSYNTH search will lead to some good images, brochure scans, old auctions and Youtube videos. 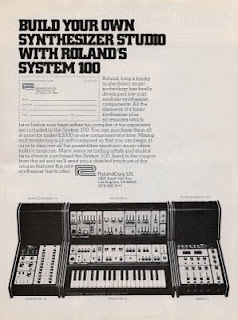 I did find a crafty version of the CS70M on the ILOVESYNTH site. These little felt instruments are created by Australia's Pul(sew)width, but a quick jump over to her Etsy site doesn't show the CS70M up for sale. But other models are, and the Minimoog is especially cute. And, it does say she will custom-build. 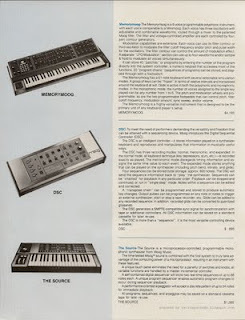 Moog 1982 Product Catalog featuring the Memorymoog, DSC, The Source, Taurus II, Liberation, Opus 3, The Rogue, and the System 15 and 55 modular systems. 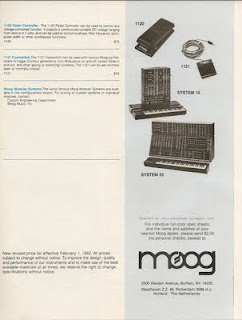 I thought I would try something a little different today and post a scan of a product catalog that I haven't seen around online too much - hopefully you will find it as enjoyable as I find Moog's 2009 catalog. As always, you can click on the images above to view each page. I've also tried something else a bit different - I've put all the pages into a PDF for those that want to download and view all the pages in one document. Let me know if you have a preference. This four-page catalog is great - it contains photos and some good descriptive text for each instrument. But what I find most interesting are the list prices. This helps me really understand how good we have it today. 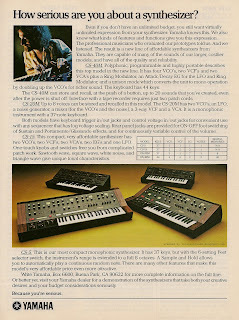 For example, the Memorymoog listed for $4,195 in 1982. That's around $7,800.00 in today's dollars. The best example is the Taurus II. 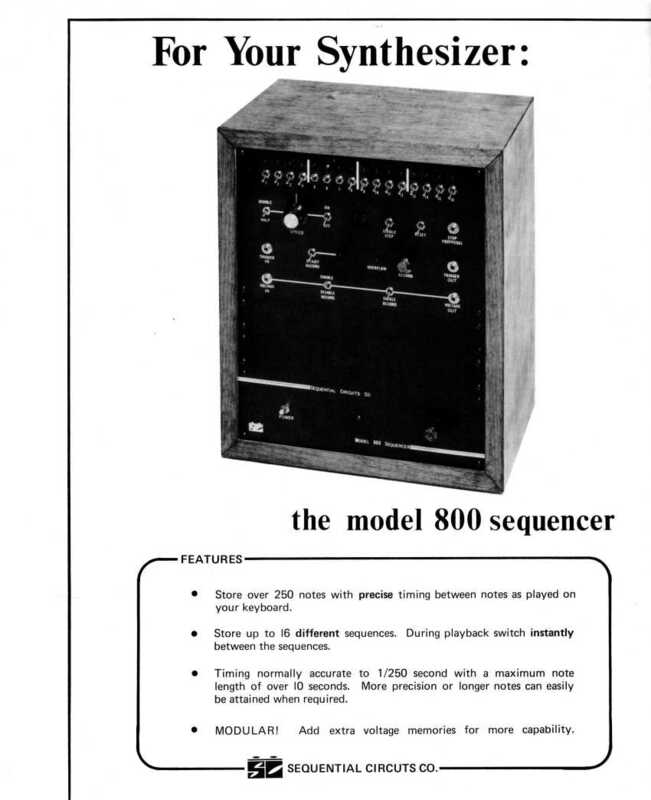 In 1982 it listed for $895 - the equivalent of around $1700 today. Moog recently announced a limited run of 1000 Taurus III's that will be faithful to the Taurus I sound, and also includes MIDI and CV, 48 programmable presents, and an arpeggiator for only $1,995. Seriously great stuff. 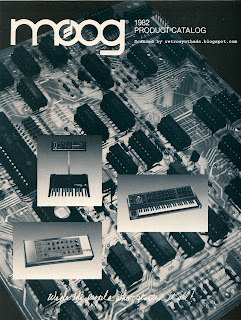 I also have an emotional attachment to this particular piece because it was one of the first Moog catalogs that I ever held in my hands. I distinctly recall being in a friend's basement years ago where he was showing off his ever-expanding home-built modular. While noodling around with the machine I mentioned that I had recently bought a Pro-1 and, due to his generous nature, he immediately turned his attention to a nearby box to find a copy of a manual. 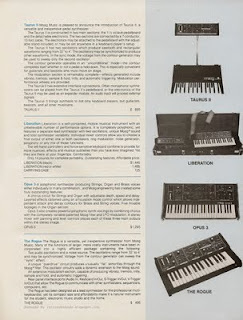 As he dug deeper and deeper into this container of wonders, more and more synthesizer manuals, catalogs, and magazines started appearing like rabbits out of a hat. 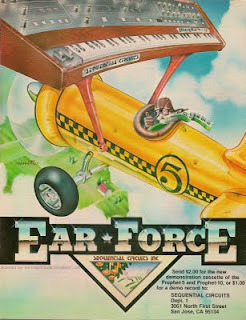 The amount of synthesizer history that came out of that box was almost comical, and a copy of this catalog was among the treasure. 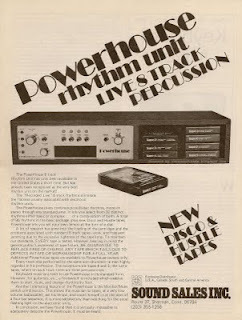 If my memory is not mistaken, he mentioned that he received the catalog along with some other manuals during a gear trade with another member of the Analogue Heaven email list. I remember spending hours in that basement reading material out of that box. 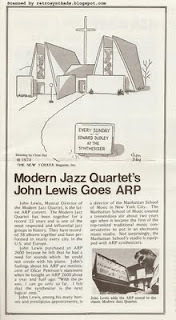 Then, years later, a copy of the catalog fell into my lap. And I obsessed over it - all over again. End note: This same friend retrofitted the Pro-1 I mention above with a blue LED while it was at his house for a good cleaning and check-up. Blue LEDs were very rare in synthesizers at the time, I think due to their cost, and his thinking was that if it was ever stolen and used on stage, I would be able to easily identify it as mine. A sincerely generous and thoughtful dude.